Throughout the course of the season, Colts.com will run a “Newcomer of the Week” following each regular season game. With the Colts having an influx of the newcomers this season here’s a look at the “Newcomer of the Week” from Tennessee. This week’s “Newcomer of the Week” comes in a combo effort on the Colts offensive line. Free agent right tackle Gosder Cherilus and rookie left guard Hugh Thornton helped pave the way for a 137-yard effort on 32 carries Thursday night. The Colts are now 11-0 when rushing at least 30 times since the beginning of the 2012 season. Chuck Pagano summed it up pretty directly when describing the offensive line’s mindset heading into Nashville. “They took this personal,” Pagano said of the offensive line. For a majority of the season, the Colts offensive line has been under heavy scrutiny. Offensive Coordinator Pep Hamilton has not wavered in his belief of the Colts rushing attack and games like Thursday night are the reason why he has faith in the ground game. The unit helped pave massive holes in the second half with the Colts rushing for over 100 yards for the seventh time this season. “What a great job up front by the o-linemen,” quarterback Andrew Luck said after the game. “Staney Havili, the tight ends, Trent [Richardson] and Donald [Brown] getting tough, tough yards. We know to win football games consistently we are going to have to run the football well. We did a decent job in the first half. I think the game sort of dictated that we couldn’t run it as much as we wanted, but I think it was great to settle down and to get points at the end of the half and to start the second half with points was big. “To get that run game going, and that last drive, what a great job. It’s tough in the fourth quarter for o-linemen when you continually pound and pound and pull and block and hit. They did a heck of a job. –Running back Daniel Herron was in the right place at the right time when he pounced on a fumbled kickoff return midway through the third quarter. The turnover gave the Colts the ball at the Titans 20-yard line. –Outside linebacker Erik Walden bounced back from a foolish first half penalty to record four tackles (two for a loss) and had a sack of Ryan Fitzpatrick. –Defensive tackle Ricky Jean Francois sniffed out a second-half screen pass for a tackle for loss, which forced a Titans field goal attempt. Throughout the course of the season, Colts.com will run a “Newcomer of the Week” following each regular season game. With the Colts having an influx of the newcomers this season here’s a look at the “Newcomer of the Week” from St. Louis. When Pep Hamilton was named Colts offensive coordinator earlier this year, he was looking for a versatile fullback to fit his scheme. In trading for Stanley Havili, the Colts have gotten exactly what they were looking for at that position. Havili had three catches (career-high) for 25 receiving yards on Sunday and is showing how he can impact the receiving game. Along with being a versatile cog on offense, Havili is also playing a variety of roles on special teams. On the season, Havili has 16 offensive touches for 74 yards along with his top duty of blocking for the Colts running backs. Havili has four special teams tackles and a forced fumble in 2013. Following the loss on Sunday, Havili was ready to turn his attention to Thursday night. “It was frustrating to say the least. We just couldn’t get things going,” Havili said after the game. –Running back Daniel Herron saw his first offensive action with the Colts and he had one catch for 57 yards. Herron mainly contributes on special teams and he had one kick return for 13 yards on Sunday. –Outside linebacker Bjoern Werner played in his second game back from injury and had three tackles (one for loss) while playing a total of 23 snaps on Sunday. –Defensive tackle Montori Hughes dressed for his second career NFL game and contributed three tackles in just 17 snaps. Pep Hamilton wasn’t expecting to spend his bye week in this fashion. Instead of reviewing film of the first two months of the season and getting a head start on the Houston Texans, Hamilton also dealt with the task of preparing for life without Reggie Wayne. “It’s one of the harsh realities of the National Football League. It was tough to say the least,” Hamilton said of Wayne’s absence. Another area that Hamilton focused on during the bye week was creating more chances for new running back Trent Richardson. Without Wayne, Hamilton knows that more attention will move towards opponents stopping the Colts run game. “I have to do a better job of coming up with schemes that not only give our offensive line a chance to be successful, but of course to create holes for Trent. Create schemes that complement his wealth of talent,” Hamilton said on Thursday. The last time Wayne missed a game with the Colts, Hamilton was a 27-year old offensive coordinator at Howard University, his alma mater. His game plans for the rest of 2013 won’t include No. 87 but that doesn’t change the goals for this offense. “We feel like even up until this point we’ve been an offense by committee. We’ve had a lot of different guys step up and make plays for us,” Hamilton said. Throughout the course of the season, Colts.com will run a “Newcomer of the Week” following each regular season game. With the Colts having an influx of the newcomers this season here’s a look at the “Newcomer of the Week” from Denver. His contributions will only grow moving forward but on Sunday night, Darrius Heyward-Bey had arguably his best game in a Colts uniform. DHB caught four passes for 44 yards, including an 11-yard touchdown catch. On the play, the threat of DHB in motion taking a handoff caused confusion for the Broncos defense. DHB then motioned back to the left side of the field and Luck found him for a well-executed touchdown. “The last couple of games we’ve been running some reverses and we just wanted to give that look and get back out in the flat,” DHB said of his first touchdown with the Colts. Later in the game, DHB did take a handoff on a reverse and ran for a 30-yard gain. With Reggie Wayne sidelined for the remainder of the season, DHB’s role will only expand over the final nine games. The Colts are sitting at 5-2 heading into the bye week and it’s wins like Sunday night that are a major reason why DHB signed with the Colts this season. –Outside Linebacker Erik Walden had a hand in all three Colts turnovers on Sunday. Walden hit Peyton Manning’s throwing arm on a fourth quarter pass that rocketed the ball up into the air and Pat Angerer eventually caught the interception. Walden also forced a goal line fumble in the fourth quarter to help the Colts preserve their nine-point victory. –Safety LaRon Landry was back in the starting lineup after he missed the past month. Landry had six tackles, including several critical stops in the open field. –Fullback Stanley Havili impacted the game in several ways on Sunday. Havili forced a fumble on punt coverage and had two tackles on special teams. He also caught a 20-yard touchdown pass midway through the second quarter to give the Colts a 19-14 lead that they would not lose. This week’s “Back-Up of the Game” presented by Venyu is safety Sergio Brown. All week the Colts talked about the importance that field position would play in taking on the undefeated Denver Broncos. It was the Colts special teams that dominated the field position category with Sergio Brown on top of his game at the gunner position. Late in the first quarter, Brown found himself in the perfect place to make a game-changing turnover. Denver punt returner Trindon Holiday fielded a McAfee punt at the Colts seven-yard line before changing fields up the far sideline. Colts fullback Stanley Havili was there to strip Holiday and Brown recovered the bouncing ball, which set up the Colts first touchdown of the evening. Brown had a pair of special teams tackles and downed two Pat McAfee punts inside of the Broncos 10-yard line. The special teams phase wasn’t the only area that Brown impacted the game. With the Colts thin in the secondary, Brown played spot duty at the safety position in the second half and added another tackle. Throughout the course of the season, Colts.com will run a “Newcomer of the Week” following each regular season game. With the Colts having an influx of the newcomers this season here’s a look at the “Newcomer of the Week” from San Diego. The normal reps for Trent Richardson were not there on Monday night. Limited offensive possessions only allowed for 10 Richardson carries against the Chargers but he did average 4.0 yards on those attempts. 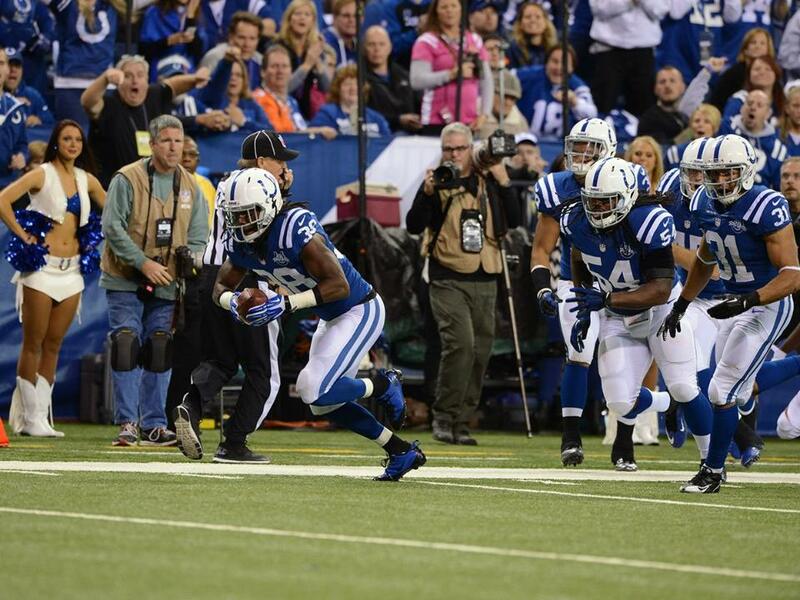 Richardson had both of the Colts third-down conversions from Monday night. During the Colts lone third quarter drive, it was Richardson with 12- and three-yard rushes on separate third-and-ones. “That’s how it should be all season,” Richardson said of the physical running nature. The most impressive Richardson play of the evening came on a 13-yard reception where he broke three separate tackles. However, it was a late fourth quarter drop that had Richardson’s attention following the 19-9 loss. –Inside Linebacker Kelvin Sheppard saw ample playing time in the second half with Jerrell Freeman sidelined (concussion). Sheppard finished with four tackles and had a nine-yard sack of Philip Rivers in the fourth quarter. –Defensive Tackle Ricky Jean Francois was back in the starting lineup after he missed the last two weeks with a groin injury. Jean Francois had three tackles and a tackle for loss which forced a field goal attempt by the Chargers. –Fullback Stanley Havili returned to the lineup on Monday night and while his stats might not indicate it, his contributions should not be taken for granted. 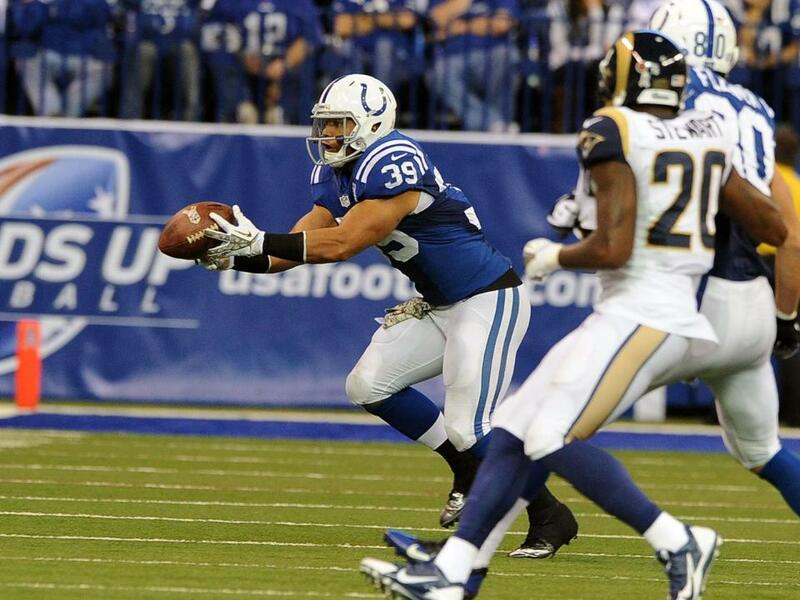 Havili did have a 12-yard reception in the fourth quarter that set up Adam Vinatieri’s 51-yard field goal. The Colts will get back on the practice field this afternoon in preparation of the Seattle Seahawks. 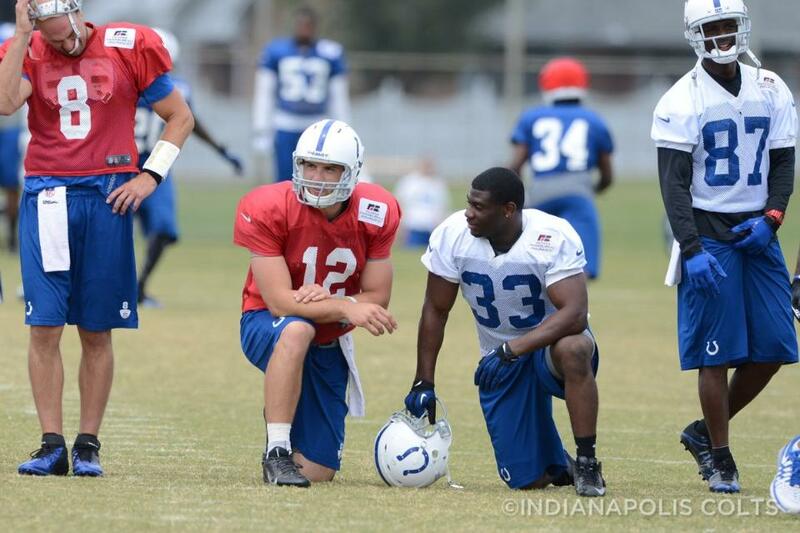 Today’s news looks at the growth of Coby Fleener and how the Colts have dealt with injuries. Take a look below at the top pieces from Wednesday, October 2nd. The growth of Coby Fleener has been a key factor in the Colts turning in a 3-1 month of September. Fleener being at the top of his game was critical. Two-tight end formations are prominent in coordinator Pep Hamilton’s offense but the team lost Dwayne Allen to a season-ending hip injury in the season-opener against Oakland. Along with remaining a viable option in the passing game, he’s being asked to amp up his contributions as a blocker, which had been Allen’s forte. Colts Insider: Can Indianapolis continue to weather its rash of injuries? Holder looks at the Colts injury issues and how the team has overcome some significant absences early on in 2013. The Colts’ injury list just keeps growing, with the latest additions being outside linebacker Bjoern Werner and fullback Stanley Havili. Those are key losses, but given the way the Colts have weathered their previous injuries, it’s understandable if you feel confident they’ll come through this latest test with flying colors, too. We’ve addressed this story before, but it’s worth repeating. It’s absolutely remarkable the way the Colts have pushed through their rash of injuries. They lost three starters to season-ending injured reserve in the first two weeks of the season (Vick Ballard, Donald Thomas and Dwayne Allen), and several key starters have missed games – safety LaRon Landry (2), running back Ahmad Bradshaw (1), center Samson Satele (2), inside linebacker Pat Angerer (2) and defensive end Ricky Jean-Francois (1) among them. The Colts’ depth has shown during this stretch. Backups like safety Delano Howell, offensive lineman Jeff Linkenbach, defensive end Fili Moala and Kelvin Sheppard deserve credit. There hasn’t been an obvious drop in performance in most cases where starters have been sidelined, and that’s rarely the case in the NFL. There has been less consistency in some instances, but the overall performance level has been impressive. Late in the 2012 season when Vick Ballard looked towards the Colts sidelines running backs coach David Walker simply just stared back at him. Ballard was the bell cow and injuries hardly let him catch his breath. Come Sunday, Ballard will be more than happy to allow other backs get into the fray. “I’ve been in two-back systems my whole career playing. It’s a way to get the other back rest. And like you said, I feed off the energy of the other back,” Ballard said earlier this week. Fellow running back Ahmad Bradshaw is expecting to make his Colts debut on Sunday afternoon and his offensive teammates can’t wait to see him in action. Pep Hamilton said on Thursday that he isn’t exactly sure how running back carries will be split up against the Raiders. Sunday will be Hamilton’s first in-person look at Bradshaw but he likes what he sees on film. “He’s consistent. He’s a power runner. He can run between the tackles but when he breaks through that first line of defense, he has the ability to score touchdowns,” Hamilton said of Bradshaw. Whether it’s Ballard, Bradshaw or Brown, the man calling the shots on Sunday knows that multiple backs are required in his offense. And he’s confident that those backs will be running behind an imposing offensive line. “Our offensive line, they’ve progressively gotten better since the start of camp and we expect that we’re going to be able to come out and control the line of scrimmage. That’s our ultimate goal,” Hamilton said on Thursday. By virtually all accounts Vick Ballard’s rookie season exceeded expectations. Not many fifth round draft picks go on to start 11 games and rush for over 800 yards in their rookie campaign. When Ballard sat down with his running backs coach David Walker to evaluate the 2012 season, they came to a common goal of working on the running back’s vision this year. “Last year I was kind of just running off ability and this year I’m running smarter by recognizing defensive fronts and knowing what to expect from our blocking schemes.” Ballard said on Thursday. Ballard hopes with improved vision he can reach the elusive 1,000-yard mark in 2013. With Pep Hamilton implementing a more balanced offensive attack, the opportunities will certainly be there for Ballard. For the past two weeks Ballard has also had the ability to share a meeting room with seven-year NFL veteran Ahmad Bradshaw. With three 1,000-yard seasons on his resume, Bradshaw knows all about being a productive back at the professional level. No matter who is at running back for the Colts this season, that player will have the luxury of a fullback leading them into holes. For Ballard, it brings him back to his Junior College days where the presence of a fullback helped him earn a SEC scholarship. Stanley Havili will be paving the way for Ballard in 2013 and the new Colts fullback likes what he sees from the guy soon to be following his path. 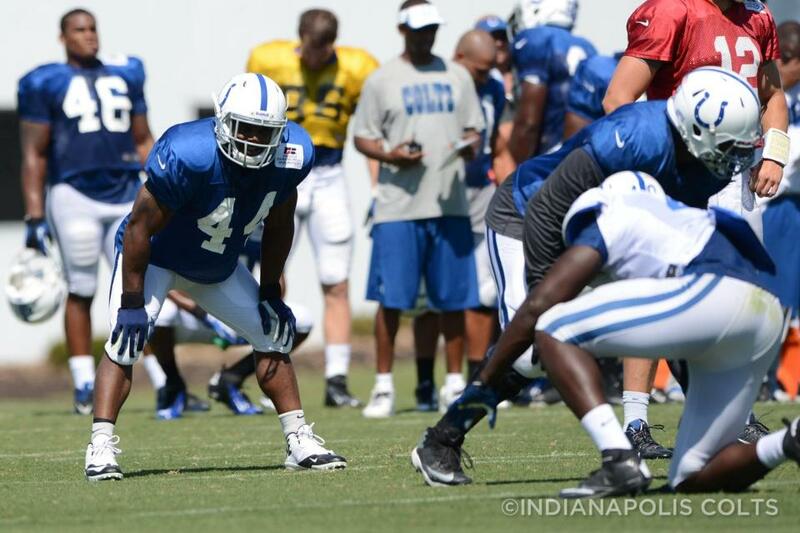 The Colts had their second padded practice of 2013 on Wednesday. In today’s news, Mike Chappell takes a look at the physical nature of Wednesday’s practice along with the addition of a true fullback to the offense. Terre Haute Tribune’s Tom James leads off his daily notebook with a piece on the Colts personnel department’s dedication to not leaving a stone unturned. Take a look below at the top pieces from Thursday, August 1st. After over a decade of utilizing anything but a fullback to line up in front of the running back, the Colts have their fullback. Chappell tells a great story about new fullback Stanley Havili meeting a person at church during the offseason. Wait, the Colts don’t have a fullback. Again, a grin crept across Havili’s face. He knew the irregular relationship between the Colts and fullbacks. “I’m pretty aware (fullbacks) are foreign here,” he said. Chappell takes a look at his five takeaways from Wednesday’s practice. Here’s a look at two of his scenes where the Colts are spreading the ball around offensively and new linebacker Josh McNary’s versatility. “For the most part, it’s exactly like riding a bike,” McNary said of never forgetting what to do on the football field. “There’s a few particulars, a few skill sets that you kind of have to knock the rust off of, like hand placement and some of the finesse moves that you would use. James massive notebook leads off with a look at Ryan Grigson and his personnel staff’s determination to not leave any stone unturned. The notebook includes a plethora of items but leads off with Grigson’s comments. “I don’t discriminate. I would see guys in those [other professional] leagues where I’d say, ‘Heck, I was in three NFL training camps. That guy can play. Why is he in this league?’ I just figure we scour those leagues as best we can and maybe we look at 250 guys and we find three guys that look like suspects and out of those three suspects, one guy can play,” Grigson explained earlier in the week.